As everyone predicted, three of the four teams with the best defensive ratings are Portland, Houston, and Atlanta. The NBA can surprise and what we thought just a few months ago may have to be completely discarded. A year ago at this time the Pacers were 28-6, outscoring opponents by near 10 points a game with a devastating defense; now they’re a mediocre team struggling to make it to 0.500 basketball. Let’s keep that in mind as we evaluate the first half of this season. There is a lot we don’t understand yet, and a lot that can change. After a harrowing start to the season, the Pistons look like the borderline playoff team most of us assumed from the summer. The catalyst, of course, was waiving Josh Smith, but there are a few other factors here. They can replace a lot of Josh Smith’s minutes with a forward who can actually shoot and space the floor for Drummond/Monroe inside, Jodie Meeks is back as a legitimately great shooter, and the team is using Drummond less as Al Jefferson, forcing post-ups, and more like Tyson Chandler. It’s not like they had never experience Smith-less basketball before; he didn’t play all 48 minutes. In fact, via NBAWOWY, the Pistons scored at a 98.3 points per 100 possession rate — dreadful — with Smith on the court and gave up 109.3 points; when he was off the court their offense improved to 109.8 and on defense 102.6. Drummond’s TS% improved by 2.1 points and Monroe’s by a mere 1.4 — but it was Jennings who reaped the benefits, improving by a whopping 10 points. Pope also saw a huge surge in his shooting percentage without Josh Smith. Let’s go to the tape here to see what’s actually happening with the Pistons with and without Josh Smith. In the first video below, Jared Sullinger actually just flat-out stops guarding Smith and clogs the lane. Smith is left wide open and eventually bricks a 20 foot jumper. In the second one, you can see how the guards have problems playing with Smith. P.J. Tucker is guarding Smith and he drops back when Jennings tries to turn the corner, and then just leaves Smith open for a while with his eye on the ball. When Jennings tries another pick and roll, Tucker drops back again and Bledsoe runs back to him too, leaving Smith wide open; Smith responds by catching the ball, not shooting, and driving inside for an awkward missed layup. Contrast that to the third video where you see what happens when you shade off Jerebko, who plays power forward when Monroe doesn’t: he hits an open three. And when you stay attached to Jerebko at the three-point line, it opens up the court for plays like the one in the last video. The power forward there is rightly concerned about giving up an open shot, and even if it’s just a split second if you don’t drop back it allows someone like Drummond to run inside (or Jennings to drive) for an alley-oop. You can see why the guards like Jennings and Pope perform so much better without Smith, and giving his shot attempts to almost anyone else on the team is a huge plus. They won’t remain undefeated forever, and they’re not this good, but we should have seen this large improvement coming. And on a side note, the NBA’s Cleveland Cavs are starting to heat up thanks to Lebron James and so is James’ favorite NFL team, the Dallas Cowboys. The Dallas Cowboys defeated the Detroit Lions to make it into round 2 of the NFL playoffs where they will play the Green Bay Packers. The Clippers had played below expectations and Griffin’s numbers have been lukewarm, playing more on the perimeter and jacking up shots like he’s Chris Bosh, but he has done well in one specific area. His assists are up even with their problems, averaging nearly 5 assists a game and assisting on an estimated 25% of his teammates’ field goals. His turnovers haven’t ballooned either, and playing outside the paint has given the team one luxury: they have a power forward who can dribble and dish to every part of the court, hitting outside shooters and guys inside. Although Griffin has not had a triple double this season, he’s hit 11 assists twice including one game last week. In fact, he accumulated five assists within the first three minutes, running the break and passing like a point guard. You can see one example in the first video below, firing a one-handed pass across the court for Redick. You can see his value in the half-court in the second video and the reason why he’s developing that jump shot. He can play the high post and draw attention, and if anyone cuts to the rim, like Olympic high-jumper DeAndre Jordan, there’s just enough hesitation from the defense that he can hit someone with an assist. Blake’s not just a dunker, and he’s had these skills for a while actually — all those criticisms years ago were ridiculous. We had a rare sight the other night: Luis Scola dunked. It’s something that only happens about twice a year, so savor the moment. In fact, he closed out 2014 with two dunks, including one last week, throwing them down in transition. One of those was was off a steal and Scola rumbled across half the court for a big two-hand dunk. Cherish these — they don’t occur often. People have short memories. After hitting 41% of his three-pointers in 2014 and 36% the year before, people forgot about how his miserable shooting led to him getting shopped around, including leaving the Lakers and one previous stint with the Rockets. It’s amazing that this guy was regarded as one of the top outside shooters quite recently, ranked improbably here in between Lillard and Mike Miller. Ariza’s shooting has plummeted far, regressing his past three years heavily to the mean. Before Washington, he was a 32% three-point shooter; and yet with him he subsisted on a high number of corner three’s, thanks to John Wall, and remade his career. After Washington, he’s back at the same level, close to 31% right now. Ariza has had a few dreadful games behind the arc including one last week where he was one for nine. Beyond some harsh regression, it’s difficult to find a real underlying cause here. Looking at his shot dashboard, he’s shooting twice as many tightly contested three-pointers and more open shots than “very” open by a slim margin. However, his shooting percentages are lower in each category too, so it’s not just that — and he probably misses being the recipient of John Wall’s passes. But defensively he’s been a sterling upgrade for them, and he’s adept at using his Condor-like wingspan to force turnovers like in the below two videos. And as strange as it sounds, it’s been Houston’s defense winning the day so far. Those esoteric draft analytic folks rated Nurkic high due to his young age and eye-popping per minute stats overseas. Then the real games started, and he barely played for a while. But his rebounding numbers in preseason were absurd, and now that he’s finally been able to hit the court we can see how this 20 year-old guy looks in the NBA. He’s already one of the best rebounders in the league, and he doesn’t appear to be a “rebound-stealer” either like Hickson. Though what’s important in the modern NBA with big men is the oft-repeated phrase rim protection, and so far via SportVU he grades out pretty well, especially for a rookie: opponents are shooting 46.2% when he’s near them at the rim and he’s getting to four of these attempts per game in only 13 minutes. He has pretty good instincts inside, nice hands, and he moves laterally well enough to wall off the lane. Nurkic had an impressive shotblocking display last weekend with blocks coming off the bench and it came off a three block game versus Chicago. You can see one in the first clip below where Gibson tries a post move on him going baseline and spinning back. Nurkic moves well and uses his size to block off an easy shot, tipping the shot attempt. The Bulls get the ball back, but Nurkic guards the drive well and then moves back to Gibson quick enough to force another miss. 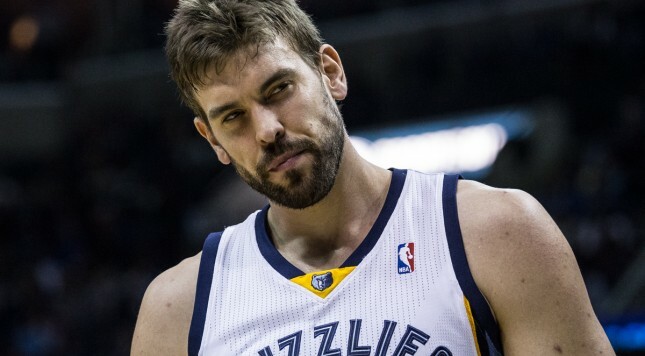 In his five block game against the menacing Grizzlies, he had some excellent defensive possessions like the second video where he capably defends Marc Gasol, arguably the best center in the game, and stuffs him at the rim. You can also see the requisite rim protection block in the last video, and he actually thwarts a drive from Calathes earlier in the play too. After a few games have been logged, we can see that Dallas has survived bringing in a new part. But it’s not exactly in the way we imagined. Their scalding-hot offense has simmered since the trade — something that would have happened anyway most likely because it’s just unsustainable to be that good, but they’ve dropped off about six points per 100 possessions so it’s not just that. Maybe this is surprising because Rondo is a 10 assists per game guy, but it shouldn’t be and the Mavericks were probably hoping he’d help enough on defense at point guard to make the switch worthwhile. So far the defense has actually been good enough to make up for the drop on offense, but let’s see what happens the rest of the season. They don’t really look like a team that’s four or five points per 100 possessions better on defense than the league average. The major changes on defense, actually, aren’t turnovers, but giving up lower effective field-goal percentages and rebounding better. I don’t believe Rondo is a significant driver on rebounds — but, again, we’ll see. I threw in a couple clips of his rebounds below from a recent game. In the first one, he gets a no effort rebound after Chandler helps force a miss. The second video is another good example. He likes to take his eyes off his defender and creep toward the rim when a shot’s about to go up so he can take the rebound; he does that there and Dallas would have been fine rebounding even if he was at the three-point line. It’ll be interesting to see how their defense does the rest of the season because before the trade their offense certainly was not the problem. Lowest Usage Rate Leader for a Team? Somewhere I heard someone comment that the Spurs, due to their unselfish philosophy, probably have the lowest usage rate leader ever. What does this mean? It’s a team where no one is a high volume shooter, and it’s tough to do because no matter how unselfish you are someone will have to use those possessions. This is essentially about finding the most balanced team. To figure out the answer to this question, I queried the stats I have going back to 1978 (when turnovers became available) with a threshold for minutes played. At first I tried 1000 minutes — it’s a nice round number and usage stabilizes before 1000 minutes most of the time. The historic leader here, the guy leading the most balanced team ever? It’s, naturally, Raymond Felton on the 2009 Charlotte Bobcats. However, there were four players on Charlotte with a higher usage rate, but they received few minutes mainly due to a major trade. Jason Richardson, for instance, had a usage rate of 25.8 but played only 491 minutes. Let’s change this gate to 500 minutes to change the results here. The leader now? It’s the same team with Radmanovic, who was traded and played under 1000 minutes. Since Richardson was the gunner in a few games, a fine answer for the team with the least amount of one-man gunning is the 1982 Washington Bullets, an intriguing team lost in time featuring the likes of Don Collins, Jeff “McNasty” Ruland, and former phenom Spencer Haywood. We can bump up the requirement to 1500 minutes too, and that would make Kenny Smith on the 1989 Kings the winner here followed closely by Roy Hinson on the 1988 Nets. I know there’s only supposed to be one true answer here, but it’s all about how you define the terms. Choose wisely. By the way, where do the Spurs rate, either this season or the previous one? Right now Ginobili has a usage rate a bit over 25 and Patty Mills could lead by the end of the season — and don’t forget Tony Parker, who led last season with a rate of 26.5. You can see the “leading” team last season in one of the lists above: on Denver, Ty Lawson, their leader on offense, had a usage rate of 22.7. The Spurs are a pass heavy, balanced team, but they still have great scorers who take a fair number of shots and would take more on a less talented team. The award here goes to the 1982 Bullets or maybe someone on the 2009 Charlotte Bobcats — take your pick.